Specifics of the pharmacological treatment and drugs of choice for the DSM 5® Depressive, Bipolar, Schizophrenia Spectrum, Anxiety, OCD, Sleep-Wake, ADHD and Neurocognitive disorders will also be discussed. Unique to this seminar is information on the common types of psychotherapeutic drugs that client’s abuse (prescription drug abuse) and methods for prevention and early detection.Disclaimer: DSM® and DSM 5® are registered trademarks of the American Psychiatric Association. The American Psychiatric Association is not affiliated with nor endorses this seminar. For further information, please visit www.dsm5.org. Identify neurotransmitter systems and neuroanatomy underlying the biological basis. Describe the major classes of drugs used to treat mental disorders. 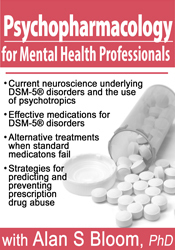 Outline evidence-based guidelines for the use of specific medications for commonly occurring DSM-5® mental disorders. Compare and contrast the effects and side effects of antipsychotics, anti-depressants, benzodiazepines and other anxiolytics, anticonvulsants and drugs used to treat other mental disorders. Discuss the abuse liability of drugs used in the treatment of anxiety, insomnia, pain, and ADHD. Explain the role of clinicians with clients receiving psychotherapeutic medications as well as psychotherapy. Alan S. Bloom, Ph.D. is professor of Pharmacology and Toxicology at the Medical College of Wisconsin where he teaches psychopharmacology to medical students and neuroscience graduate students. He earned a dual Ph.D. in psychology and pharmacology and consults regularly with psychiatrists and attorneys in drug abuse and other pharmacology related cases. For the past 20 years he has conducted research on the impact of drugs of abuse (marijuana, cocaine, etc.) on the brain through use of functional magnetic resonance imaging (fMRI). He directs research on the cognitive effects of chemotherapy drugs administered to women with breast cancer, commonly known as “chemo-brain”. His studies have been funded by the NIH and other national organizations and reported in an extensive number of publications and presentations. Dr. Bloom serves on the NIDA Centers grant review panel and is an appointed member of the Controlled Substance Board of the State of Wisconsin. He is a strong and experienced presenter providing lively, information packed seminars. Dr. Bloom encourages the active learning of participants through application of the material in case studies and problem-based learning. In 1997 he was elected to membership in the Medical College of Wisconsin Society of Teaching Scholars.